When you’re dealing with a collectible that’s uncommon but not truly rare, patience is the key. With most things, as long as you wait long enough and keep checking places like eBay regularly, it should be possible to get one for a reasonable price. That’s what happened in this case. 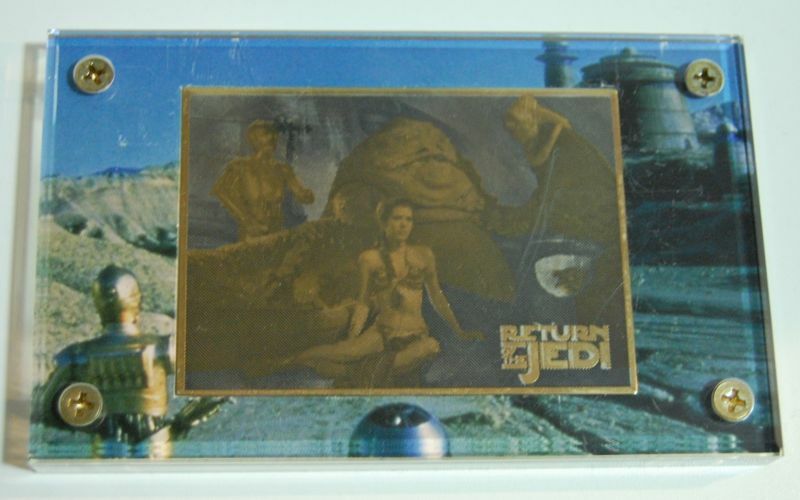 I first posted about this series of 24K gold cards nearly two years ago when I got the version with Han Solo and (CGI) Jabba. 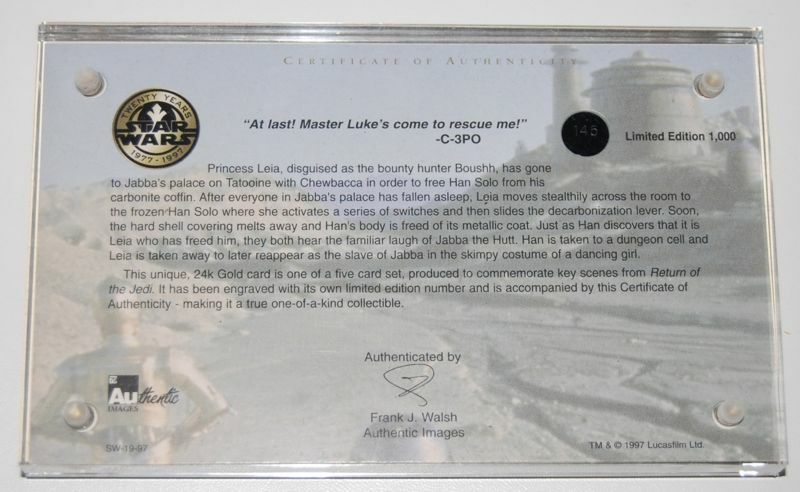 I had been watching for the more iconic “Jabba and Slave Leia” version to appear for a reasonable price, but people have a tendency to list them for prices that are really quite high (and of course they don’t usually sell). But I finally found this one for sale from England, and the cost of shipping was actually more than the price of the item itself. Like the one I posted about before, this one comes in a nice leatherette case with a velvet lining. 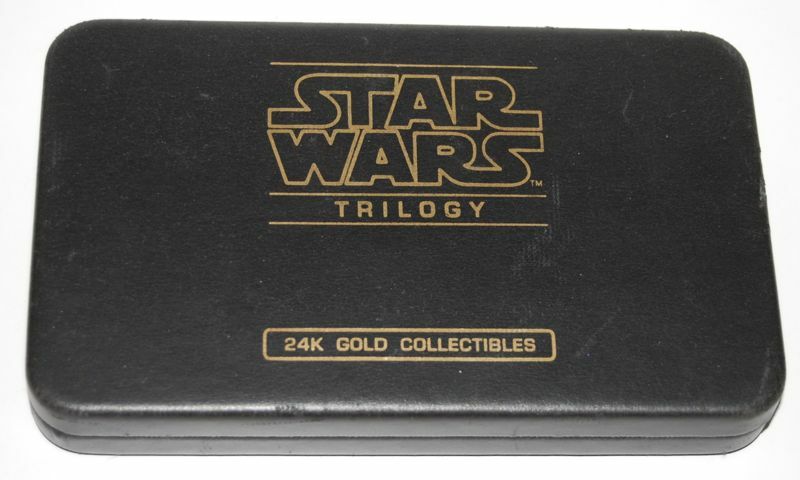 It’s encased in a thick slab of acrylic, which gives it some weight and protects the gold card, which I assume is very thin. It looks like the photo was created on the gold by making little indentations of various depths (or directions?). It’s not printed on the surface. It’s certainly an interesting effect. It’s quite difficult to photograph, but I think you get the idea. Depending on the angle, it looks very golden and metallic, but change the angle a bit and you can see the photo very well. On the back is a little explanation about the scene and the item itself. 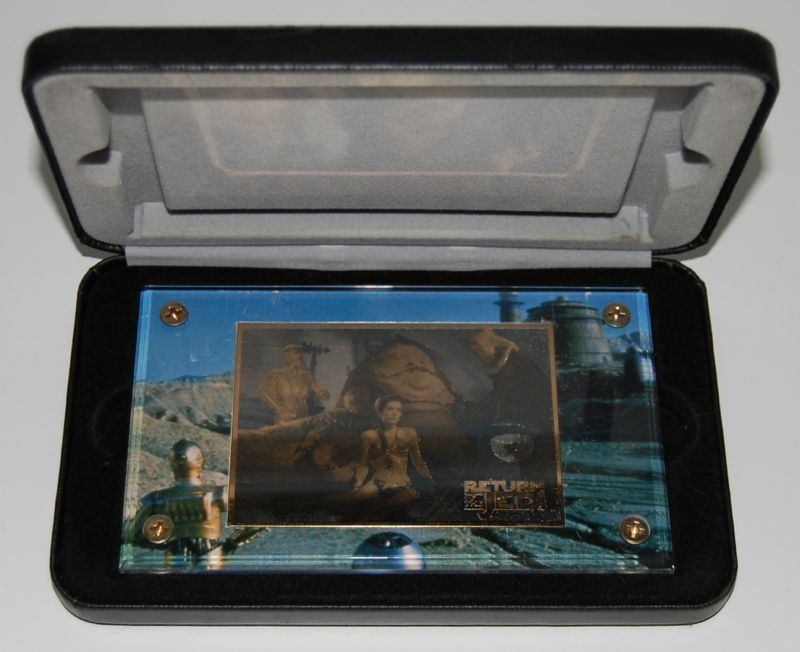 As I said last time, I certainly wouldn’t pay the $100 they were apparently asking for this when it originally went on sale during the 90s, but if you can get a good deal they are certainly interesting collectibles, if a little odd. Nice acquisition. I have not seen these before.